Preheat oven to 350 degrees. Boil water and add noodles. Cook according to package directions(about 8 minutes). Drain noodles and return back to pot. Meanwhile, melt butter in a saucepan on low heat. Add flour and whisk together. Add milk and continue whisking until lumps are gone. Let stand over low heat about 3 minutes, stirring occasionally. Turn off heat and let stand to thicken, add salt and pepper. 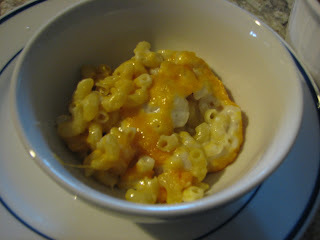 In a nine inch round baking dish, layer half of the noodles with half of the cheese. Layer the rest of the noodles and pour on the sauce. Top with the rest of the cheese. Place in oven and bake for about 20 minutes or until it is warmed through and the cheese is nice and gooey. Let cool slightly. Or just eat it straight out of the oven because you just couldn’t resist! Enjoy, if there is any left!